As reported by Mike Jurecki on Twitter, Arizona Cardinals head coach Bruce Arians is concerned about WR John Brown not being able to fully practice due to soft-tissue injuries he has been dealing with since last season. 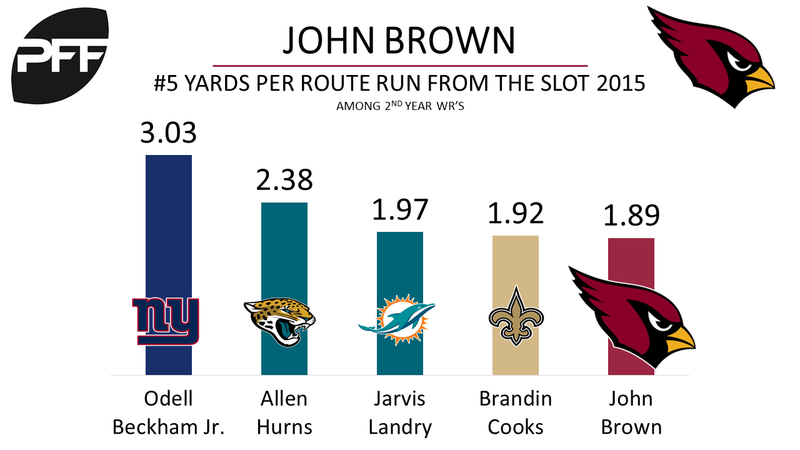 Brown had a promising year in 2015 where he posted his best career overall grade (82.4), passer rating when targeted (105.7), and yards per route run (2.00). However in 2016 those numbers dropped to an overall grade of 77.4, 68.8 passer rating when targeted, and just 1.31 yards per route run. The Cardinals do not have another WR on their roster that has matched the production of Brown in 2015, besides Larry Fitzgerald who graded ninth out of 115 qualified wide receivers by PFF in 2016 (86.8 overall). Additionally J.J. Nelson is the only other receiver on the Cardinals roster ranked by PFF in 2016, grading 71st out of 115 qualified WR’s (71.0 overall).